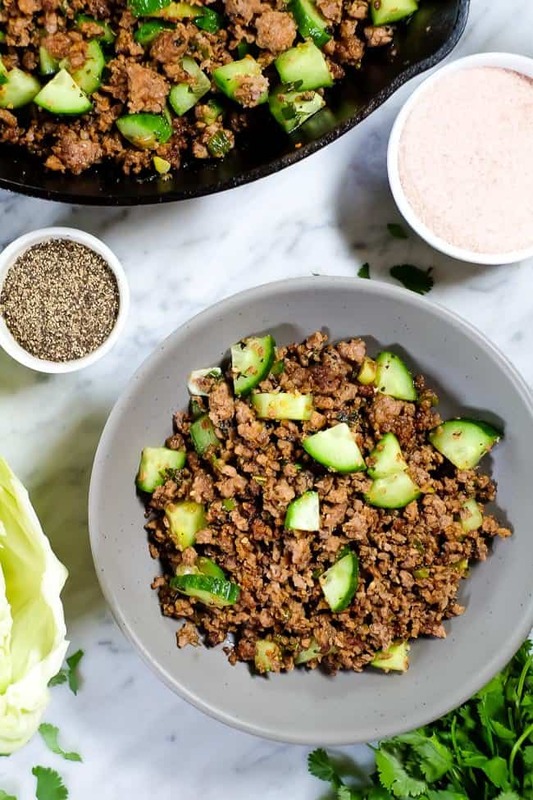 This Thai larb recipe is so fresh and flavorful. It’s Paleo + Whole30 and you can make it with either chicken or pork to suit your taste. 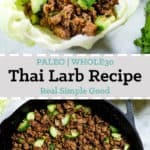 Experience authentic Thai flavors with this larb recipe and enjoy it guilt-free knowing it’s squeaky clean and Whole30 compliant! You decide! 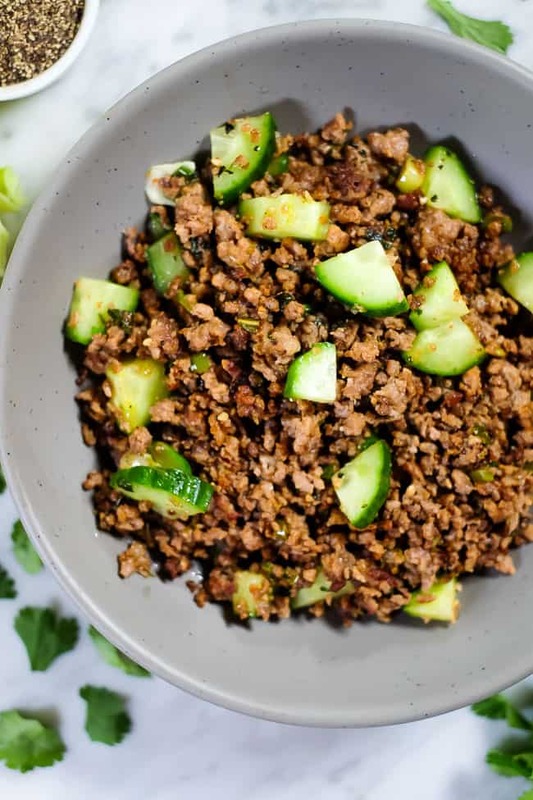 Both chicken and pork do a great job of adapting and taking on whatever flavors you pair them with, so either way you’re going to really enjoy this larb recipe. You will love the combination of seasonings, herbs and citrus. 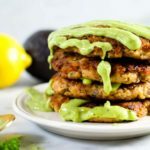 It’s such a tasty, yet easy way to get dinner on the table! And the leftovers make a tasty lunch, too! 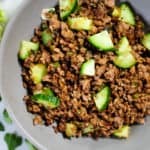 You can serve this larb recipe as is or over rice and/or greens. 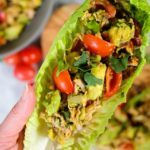 You can also use any broad leaf greens to turn this larb recipe into a tasty lettuce wrap! Depending on your mood and preferences, you might go with romaine or maybe cabbage for a little extra crunch! Bibb and butter lettuce are great options, too! 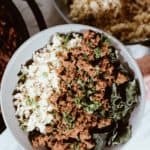 We used cabbage the day we made this larb recipe to take photos, and the crunchy goodness was the perfect pair to the fresh flavors of the larb. What do you think you’ll try first? It’s a weeknight, and you need something on the table for dinner real quick. Sound familiar?! 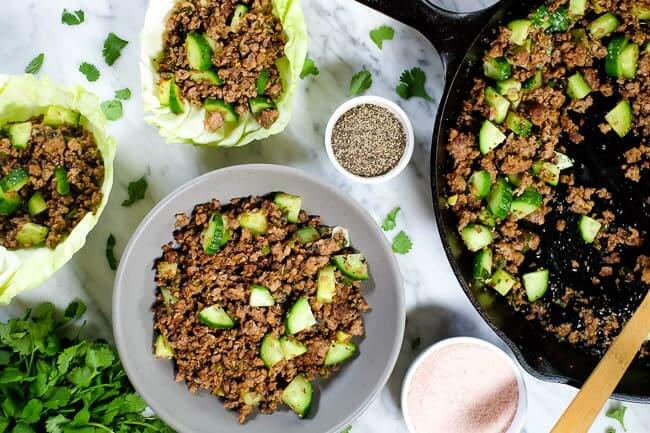 Well, this Thai larb recipe is super quick and easy to make! 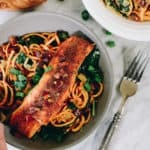 You’ll have it on the table in under 30 minutes and if you have any leftovers, you can pack them for lunch the next day! 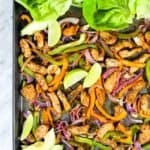 I say IF you have leftovers because if you’re like us…you can easily down this one for dinner if you’ve got you and a spouse or partner or kids to feed! 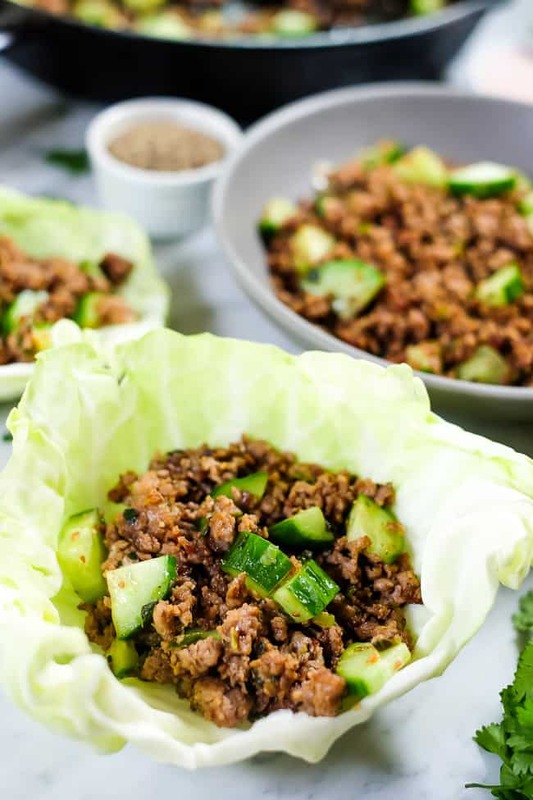 Whether you’re looking for a simple, quick and easy dinner or just want something tasty that feels like takeout but much healthier, give this Thai larb recipe a try! Let us know how it goes by leaving a comment below. Then, take a photo and tag us on Instagram @realsimplegood, so we can check it out! Also, do you follow us on Instagram yet? If so, thanks so much, but if not make sure to give us a follow so we can stay connected! This Thai larb recipe is so fresh and flavorful. It's Paleo + Whole30 and you can make it with either chicken or pork to suit your taste. 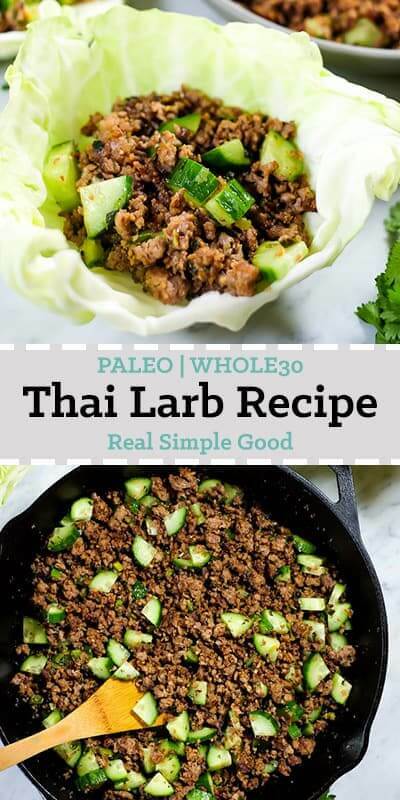 Experience authentic Thai flavors with this larb recipe and enjoy it guilt-free knowing it's squeaky clean and Whole30 compliant! Chop shallot and garlic as noted. Heat a large skillet over medium-high heat and add sesame oil. Once hot, add shallot and garlic and cook, stirring constantly for 1-2 minutes. Add pork to the pan and break it up into small bits. Cook, stirring occasionally, until the pork is browned and has developed some crispy bits around the edges of the pork pieces, about 10-12 minutes. While the pork is cooking, zest the lime and chop green onions, cilantro, mint and cucumber as noted. Once the pork is browned, turn heat to low and add in the lime zest and juice, green onions, cilantro, mint, fish sauce, apple cider vinegar and chipotle powder. Mix well and simmer for 2-3 minutes. Taste and season with salt and pepper or additional chipotle powder as desired. Remove from heat and stir in the cucumber pieces. Serve alone in a bowl or in lettuce or cabbage leaves. 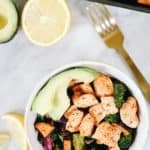 Nutrition facts are an estimate provided for those following a Ketogenic or low-carb diet and do not include optional broad leaf greens for this recipe. See our full nutrition information disclosure here.